1. Poach the salmon in boiling water for 5 minutes, drain, cool and flake the flesh. 2. Microwave the spinach in a large bowl covered with clingfilm for 3-4 minutes until defrosted, drain and press 10-15 minutes until tender, drain and roughly crush, stir in the remaining oil, ground and chopped coriander, season and serve with the chicken. out excess liquid. 3. 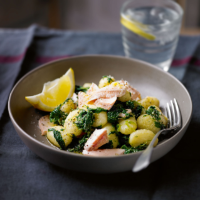 Cook the gnocchi in boiling water for 3 minutes, drain and return to the pan with the salmon, spinach, lemon zest and juice and cheese, stir and season to taste.